Home Investor Blogs 2019 Seattle Housing Market: Still a Good Choice for Investment? For a long time, the Seattle housing market has been described as a “frenzy” with its tight inventory and soaring house prices favoring sellers. For this reason, many real estate investors pause when it comes to buying property in the city. However, recent significant changes in the market suggest that things are about to change. How will the real estate market in Seattle look in 2019? Is it going to be as hot as it has been over the last few years? And what could Amazon HQ2 mean for Seattle? These are the biggest questions on the minds of Seattle real estate investors. In this blog post, we answer these questions and present to you the top trends investors need to know for the Seattle housing market. This will help you decide if it’s truly a good time to invest in rental properties in Seattle next year. 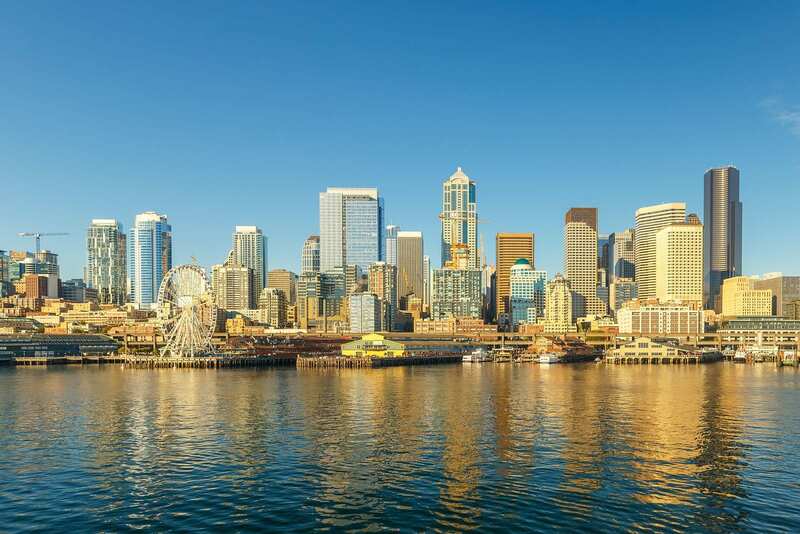 So, without further introductions, here’s all you need to know about Seattle real estate 2019. Over the past 10 years, Amazon has grown more than tenfold in Seattle, from about 4,000 employees to over 45,000. At the same time, this boom drove the median home price in the Seattle housing market to shoot up from $420,000 to $720,000. Home prices in the metro area as a whole have gone up 47% which is nearly twice as high as the national increase of 24%. That’s according to Redfin, which published a blog post that envisions how Amazon HQ2 might transform the real estate market. Redfin believes that Amazon HQ2 is already cooling down Seattle’s frenzied housing market and gives two scenarios of what might happen. For the extreme scenario (where the new move draws almost half of Seattle’s current employees away), Redfin estimates that new listings could jump to their highest levels since 2009. In the less extreme scenario (where 1 of 20 Seattle employees decides to leave for HQ2), there would be an average of around 94 additional new listings each month. Combined with a drop in sales due to decreased hiring at the Seattle HQ, both scenarios have the potential to shift the balance and “quickly turn Seattle into a buyer’s market” in 2019. So, if you think that Amazon HQ2 will depress Seattle real estate properties, think again. While there won’t be a housing crash, there’ll definitely be a noticeable cool down as Seattle moves back to a more balanced market. Seattle has always been one of the most expensive real estate markets in the US with high costs of living. In May, the Seattle housing market was in an “extreme frenzied” state, where real estate sellers were listing their homes at premium pricing levels and still received multiple offers. Now, however, real estate properties are selling at the market price which is a good sign for Seattle real estate investors. While it’s too early to call Seattle a buyer’s market, this further proves that the city is shifting toward the “neutral” territory. This is a change from the past few years when Seattle was a strong seller’s market. Thus, it’s a great time to invest in the Seattle housing market now that home price increases are slowing down. Are you a real estate investor looking for an investment property in Seattle? Use our Property Finder to find lucrative investment properties that match your criteria in a matter of minutes! The biggest change affecting the Seattle housing market right now has to do with the inventory. For years, the city has experienced a shortage of housing inventory. This has presented some challenges for real estate investors (like rising prices) and forced them to compete for the limited supply of homes for sale. While that’s been the norm for almost a decade, a series of recent reports show significant inventory growth within the Seattle real estate market. The rising number of homes for sale in the city is a positive sign for real estate investors planning to buy investment properties in 2019. This means you’ll have more properties to choose from today compared to those who purchased earlier this year or in 2017. Keep in mind that despite the new inventory hitting the market in recent months, the Seattle housing market still suffers from a below-average level of supply. Real estate experts identify a balanced market as one with 5-6 months of supply of homes for sale. Seattle, on the other hand, has about a 1.5-months of supply. So, while it’s going to take time for Seattle to shift from a sellers’ market to a buyers’ market, it’s nice to see a bit more supply to balance things out. Related: The 2019 US Housing Market: A Seller’s Market or Buyer’s Market? So, Is 2019 a Good Time to Invest in the Seattle Housing Market? Last year, Seattle was the #1 hottest real estate market but slips to #16 in this year’s PwC Emerging Trends in Real Estate Survey. Nonetheless, the survey and numerous other reports still view Seattle as an attractive place in which to invest. 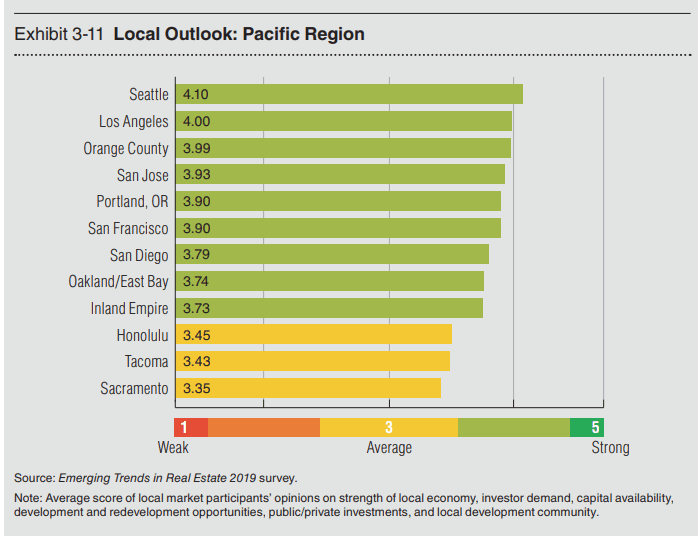 In fact, according to the same survey, investor demand in Seattle is still the strongest in the Pacific Region. Many property investors don’t consider buying rental properties in liberal markets because they’re afraid they won’t be able to protect their investment. However, there are a number of points in favor of Seattle. First, Washington State outlawed rent control, meaning you can raise rents to keep up with inflation and demand. Second, if your tenant breaks the lease without consent, he/she remains liable for rent through the end of the lease. 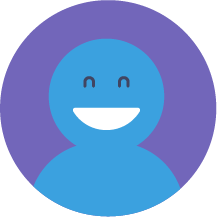 Moreover, rental property owners have significant freedom in their screening questions. Around a third of the US population rent their homes. However, in the Seattle housing market, the rate is over half. This is mainly due to the high cost of homes in the city. Even though price increases are slowing down, the median home price remains unaffordable to most homebuyers. Moreover, Seattle is the #10 best place to live (according to U.S.News) and one of the top cities that attract millennials. However, these young adults are less willing to be tied down to a home and, instead, prefer to rent. Furthermore, with increasing interest rates, first-time homebuyers are content to keep renting for now. Finally, the stabilizing rents is another reason why buying a rental property makes a profitable and wise investment for Seattle real estate investors. 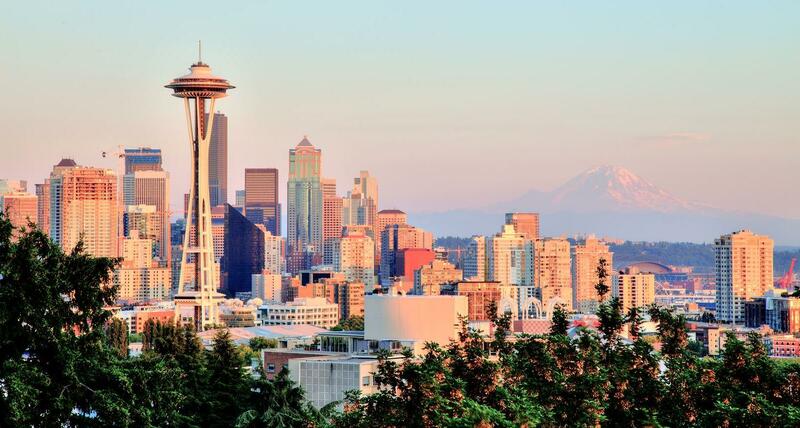 Just because Seattle has been dethroned as the hottest market in the US, doesn’t take away the fact that it had repeatedly ranked in many lists among the top places to invest in real estate. Properties have appreciated and gone up in value consistently for years, meaning sellers get high returns on investment. The demand for homes continues to rise, meaning real estate investors with buy-and-hold properties are pretty much guaranteed a good ROI. Lastly, we’ve already mentioned that stabilizing rents and the fact the WA state outlawed rent control are good signs for owners of rental properties. This means you’ll certainly profit from investing in the Seattle housing market no matter what investment strategy you go for! So you’re convinced that Seattle remains a good place to invest in real estate, but where should you invest? Here are the top 4 neighborhoods in the city of Seattle according to Mashvisor’s analytics and Investment Property Calculator. To learn more about how we’ll help you make faster and smarter real estate investment decisions, click here. The Seattle housing market is finally cooling down, making 2019 a good time to invest in the city. Slowing home prices and growing inventory indicate that Seattle is shifting from a seller’s to a buyer’s market. As a real estate investor, you should take advantage of this and buy your Seattle investment property as soon as possible. To search for, analyze, and find the best and most profitable investment properties in any of these neighborhoods, start out your 14-day free trial with Mashvisor now! Should You Invest in Long Beach Houses for Sale in 2019? Oakland Real Estate Market: To Invest or Not to Invest? Florida Real Estate 2018 – Where Should I Invest?